Presidential elections are the centerpiece of American democracy, as citizens go to the polls every four years to choose a new leader. Prior to the election of George Washington in 1789, no country in the world had ever peacefully transferred power in a national election. Today, we take this for granted, as American elections have become a model for the entire world. For more than 200 years, candidates have campaigned for the highest office in the land, debating the major issues facing the country, capturing the attention of the voters, and reflecting the will of the people. The presidential campaign of 2008—the 56th in American history—culminating in the election of Barack Obama, was the most significant event of the year, and many presidential elections, especially those of 1800, 1828, 1860, 1896, 1912, 1932, 1960, and 1980, have been turning points in American history. 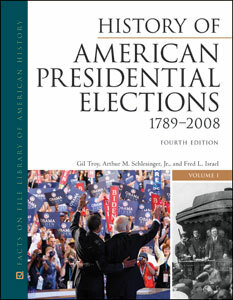 History of American Presidential Elections: 1789-2008, Fourth Edition is an authoritative, completely up-to-date reference set featuring articles on every presidential election in American history, concluding with the groundbreaking election of 2008. All of the articles are written by distinguished historians and provide a solid history of the campaigns, conventions, and candidates. Edited by noted presidential historians Gil Troy, Arthur M. Schlesinger Jr., and Fred L. Israel, this comprehensive three-volume set includes complete voting returns by state, electoral maps, and additional statistical data covering all 56 presidential elections in U.S. history. Each article has been completely updated, and detailed chronologies and comprehensive overviews cover every election. With a wide assortment of outstanding articles and useful features, such as chronologies, overviews, and bibliographies, History of American Presidential Elections: 1789-2008, Fourth Edition is destined to become the definitive reference on the subject.